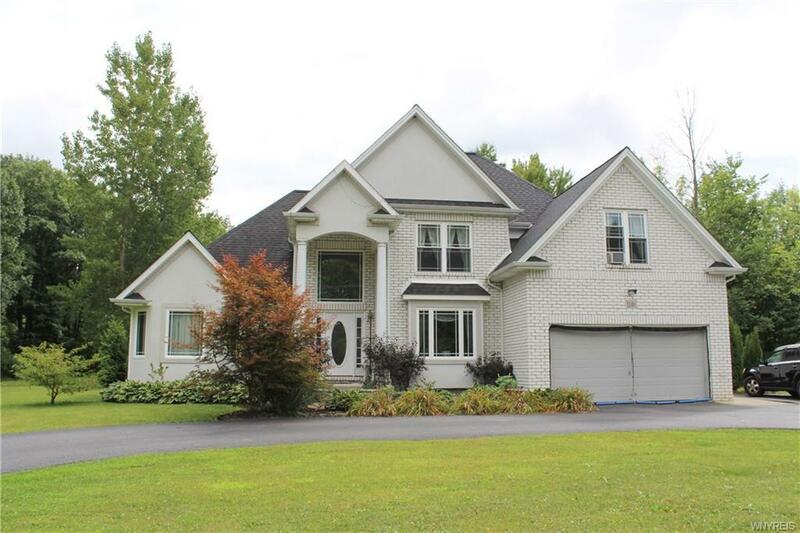 Custom built 2800 sq ft Town of Lewiston home truly has it all! Situated on 1.6 acres, boasting 5 BR, 3 full & 2 half baths. 1st flr Master suite plus another guest suite on the 1st flr complete w/it's own full bath. Walk-in closets in all BR's. Stunning foyer opens to the Great Rm w/vaulted ceilings & gas FP. 2nd flr loft is a perfect space for a home office. 3 additional BR's on the 2nd flr. Fin basement w/rec rm, 1/2 ba & 2 sep storage rms. Plenty of space to entertain in the lrg eat-in kitchen plus formal DR. Corian counters,1st flr laundry,C/A, cent vac, sec sys, whole house WiFi, 2 car gar has center drain & hot/cold water for washing cars or pets. Sliding glass drs open up to the private backyard w/huge deck, covered shelter, & 30 ft heated pool. Also has a gas line for your grill.